At La Capilla de Santa María, parishioners weatherized their church in an effort to decrease the utility bills that took up a fifth of the annual budget. At Jubilee Community Church, parents and the education coordinator revised the Sunday School curriculum to integrate care of creation for all age levels. And at All People's Church in Milwaukee, the sanctuary became a free farmer's market on Sundays with produce grown by youth. Natural Saints shares the stories and strategies of contemporary church leaders, parishioners, and religious environmentalists working to define a new environmental movement, where justice as a priority for the church means a clean and safe environment for all. 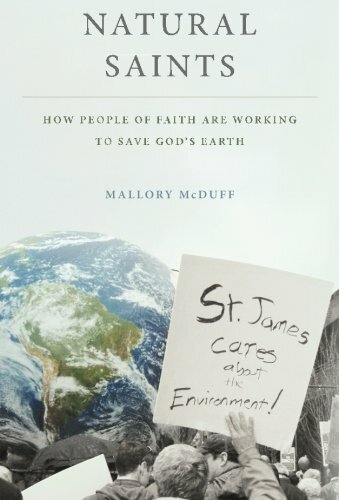 Mallory McDuff shows that a focus on God's earth is transforming both people and congregations, creating more relevant and powerful ministries . As a result, people of faith are forming a new environmental movement with a moral mandate to care for God's earth. McDuff highlights eight key ministries: protecting human dignity, feeding the hungry, creating sacred spaces, responding to natural disasters, promoting justice, making a pilgrimage, educating youth, and bearing witness. With two daughters in tow, she traveled across the country to document environmental actions grounded in faith. This journey transformed the author's own faith and hope for a sustainable future. Congregations and individuals seeking to integrate care of creation into their faith community will find inspiration and concrete advice in the lives of these natural saints.